This guide describes the authentication and authorization features available to secure your Apache Isis application. Apache Isis documentation is broken out into a number of user, reference and "supporting procedures" guides. By "authentication" we mean logging into the application using some credentials, typically a username and password. Authentication also means looking up the set of roles to which a user belongs. By "authorization" we mean permissions: granting roles to have access to features (object member) of the app. Isis has two levels of permissions. Read permission means that the user can view the object member; it will be rendered in the UI. An action with only read permission will be shown disabled ("greyed out". Write permission means that the object member can be changed. For actions this means that they can be invoked. Isis provides an API for both authentication and authorization, and provides an implementation that integrates with Apache Shiro. Shiro in turn uses the concept of a realm as a source for both authentication and optionally authorization. Shiro ships with a simple text-based realm — the IniRealm — which reads users (and password), user roles and role permissions from the WEB-INF/shiro.ini file. The SimpleApp archetype is configured to use this realm. Shiro also ships with an implementation of an LDAP-based realm; LDAP is often used to manage user/passwords and corresponding user groups. Apache Isis in turn extends this with its IsisLdapRealm, which provides more flexibility for both group/role and role/permissions management. In addition, the (non-ASF) Isis Addons provides the Isis addons' security module, which also provides an implementation of the Shiro Realm API. However, the security module also represents users, roles and permissions as domain objects, allowing them to be administered through Apache Isis itself. Moreover, the security module can optionally delegate password management to a subsidiary (delegate) realm (usually LDAP as discussed above). In addition to Apache Isis' Shiro-based implementation of its authentication and authorization APIs, Isis also provides a "bypass" implementation, useful for quick-n-dirty prototyping when you want to in effect disable (bypass) security completely. A further aspect of security is auditing: recording what data was modified by which user. Apache Isis does define two service APIs — CommandService and AuditingService — that provide hooks to track which actions (commands) are invoked, and what data was modified as a result (auditing). Isis does not itself provide any in-built implementations of these APIs, but there are implementations within (non-ASF) Isis Addons, namely the Isis addons' command module and the Isis addons' auditing module. Apache Isis' security mechanism is configurable, specifying an Authenticator and an Authorizor (non-public) APIs. The Shiro security mechanism is an integration wih Apache Shiro that implements both interfaces. The SimpleApp archetype is pre-configured to use Apache Shiro, so much of what follows is set up already. The figure above doesn’t tell the whole story; we haven’t yet seen how Shiro itself is configured to use realms. The ShiroAuthenticatorOrAuthorizor is in essence the glue between the Apache Isis runtime and Shiro. Based on this Shiro will then read WEB-INF/shiro.ini file to configure its Realm definitions for authentication and authorization. Shiro’s ini file supports a "poor-man’s" dependency injection (their words), and so $realmName in the above example is a reference to a realm defined elsewhere in shiro.ini. The subsequent sections describe the specifics for thevarious realm implementations available to you. It’s also possible to configure Shiro to support multiple realms. You can learn more about Shiro realms in the Shiro documentation. Probably the simplest realm to use is Shiro’s built-in IniRealm, which reads from the (same) WEB-INF/shiro.ini file. This is suitable for prototyping, but isn’t intended for production use, if only because user/password credentials are stored in plain text. Nevertheless, it’s a good starting point. 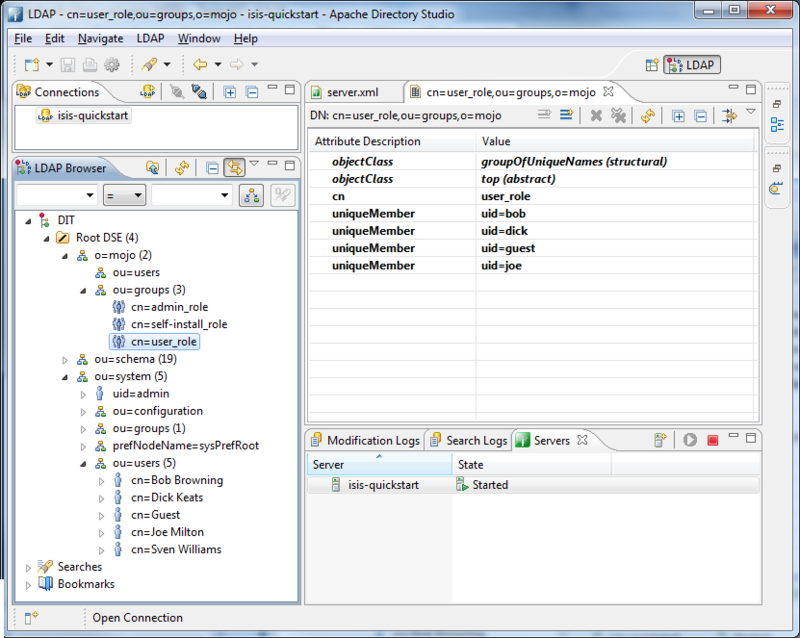 The app generated by the SimpleApp archetype is configured to use this realm. The realm is responsible for validating the user credentials, and then creates a Shiro Subject which represents the user (for the current request). 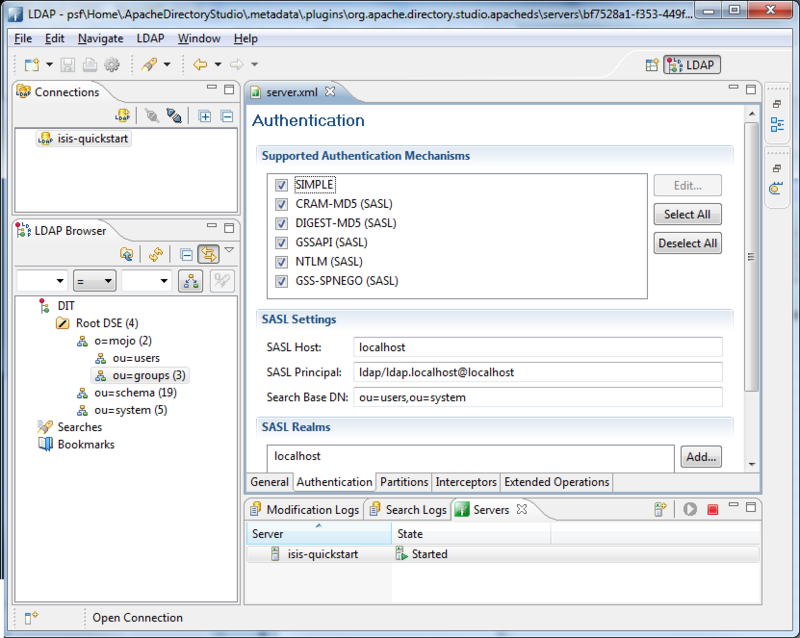 Apache Isis Authenticator component then interacts with the Subject in order to check permissions. (Unlike other realms) there is no need to "define" $iniRealm; it is automatically available to us. the roles are mapped to permissions in the [roles] section. The format of these is described below. This section lists users, passwords and their roles. The first value is the password (eg "pass", the remaining values are the role(s). This section lists roles and their corresponding permissions. memberName is the property, collection or action name. and where each of the parts of the permission string can be wildcarded using *. Because these are wildcards, a '*' can be used at any level. Additionally, missing levels assume wildcards. The format of the permissions string is configurable in Shiro, and Apache Isis uses this to provide an extended wildcard format, described here. There’s no requirement for all users/roles to be defined in the shiro.ini file. Instead, a realm can be defined that loads its users/roles from some other resource. 2 in this case load the users/roles from the src/main/resources/webapp/realm1.ini file. If configured this way then the [users] and [roles] sections of shiro.ini become unused. Instead, the corresponding sections from for realm1.ini are used instead. Isis ships with an implementation of Apache Shiro's Realm class that allows user authentication and authorization to be performed against an LDAP server. The LDAP database stores the user/passwords and user groups, while the shiro.ini file is used to map the LDAP groups to roles, and to map the roles to permissions. 3 Apache Isis' implementation of the LDAP realm. 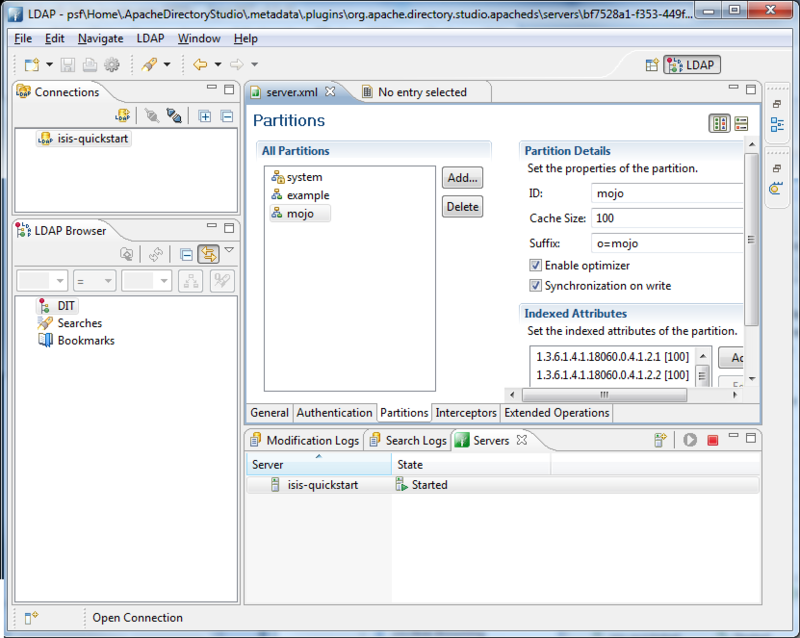 The above configuration has been tested against ApacheDS, v1.5.7. This can be administered using Apache Directory Studio, v1.5.3. To make the configuration maintainable, use "\" to separate the mappings onto separate lines in the file. Use this technique for both group to roles mapping and role to permission mapping. If you use the '' after the "," that separates the key:value pairs it is more readable. 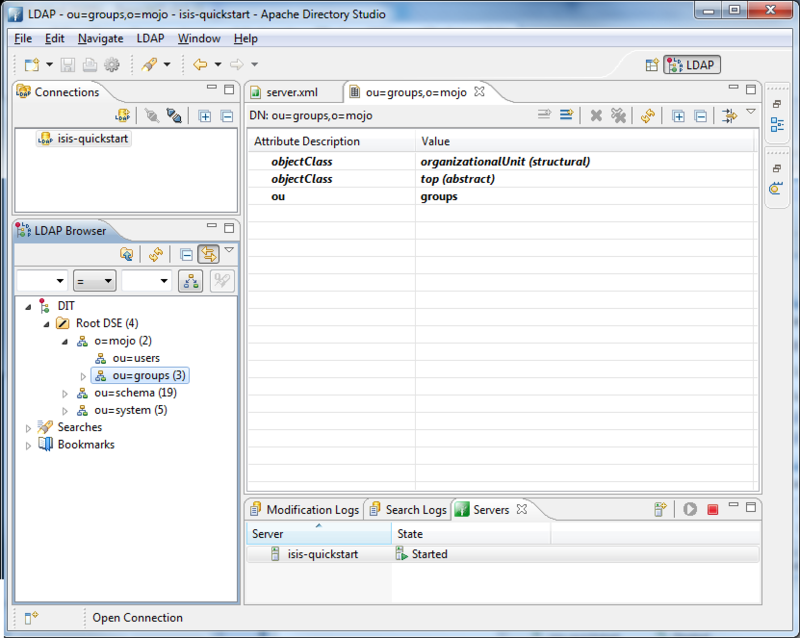 The screenshots below show how to setup LDAP accounts in ApacheDS using the Apache Directory Studio. The setup here was initially based on this tutorial, however we have moved the user accounts so that they are defined in a separate LDAP node. The Isis Addons' security module (not ASF) provides a complete security subdomain for users, roles, permissions; all are persisted as domain entities. What that means, of course, that they can also be administered through your Isis application. Moreover, the set of permissions (to features) is derived completely from your application’s metamodel; in essence the permissions are "type-safe". where the IsisModuleSecurityRealm realm is the implementation provided by the module. 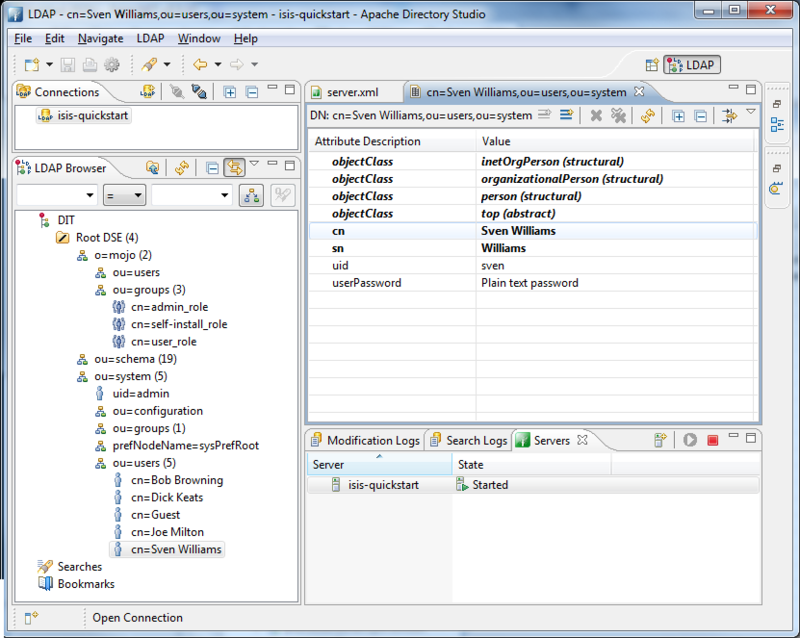 In the configuration above user passwords are stored in the database. The module uses jBCrypt so that passwords are only stored in a (one-way) encrypted form in the database. The security module has many more features than are described here, all of which are described in the module’s README. The README also explains in detail how to configure an existing app to use this module. You can also look at the Isisaddons todoapp example (not ASF), which is preconfigured to use the security module. There is nothing to stop you from using some other Realm implementation (or indeed writing one yourself). 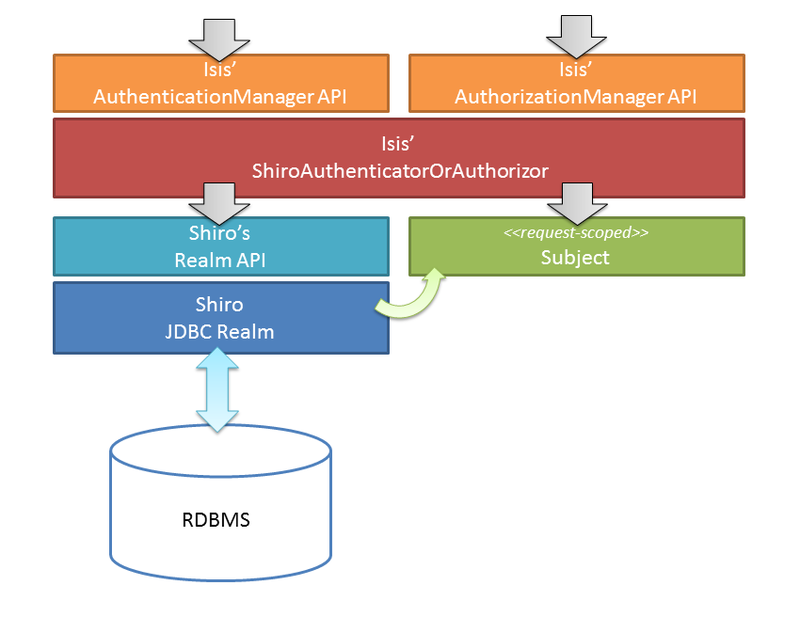 For example, you could use Shiro’s own JDBC realm that loads user/password details from a database. If you are happy to use a database then we strongly recommend you use the Isis addons' security module instead of a vanilla JDBC; it is far more sophisticated and moreover gives you the ability to administer the system from within your Isis application. There’s quite a lot of configuration required (in WEB-INF/shiro.ini) to set up a JDBC realm, so we’ll break it out into sections. We next need to tell the realm how to query the database. Shiro supports any schema; what matters is the input search argument and the output results. The permissionsLookupEnabled is very important, otherwise Shiro just returns an empty list of permissions and your users will have no access to any features(!). Using the above configuration you will also need to setup a DataSource. The details vary by servlet container, for example this is how to do the setup on Tomcat 8.0. The name of the DataSource can also vary by servlet container; see for example this StackOverflow answer. If using the text-based IniRealm or Isis' LDAP realm, then note that Shiro also allows the string representation of the permissions to be mapped (resolved) to alternative Permission instances. Apache Isis provides its own IsisPermission which introduces the concept of a "veto". A vetoing permission is one that prevents access to a feature, rather than grants it. This is useful in some situations where most users have access to most features, and only a small number of features are particularly sensitive. The configuration can therefore be set up to grant fairly broad-brush permissions and then veto permission for the sensitive features for those users that do not have access. the admin_role with access to everything. The permission group concept is required to scope the applicability of any veto permission. This is probably best explained by an example. Suppose that a user has both admin_role and user_role; we would want the admin_role to trump the vetos of the user_role, in other words to give the user access to everything. Because of the permission groups, the two "!reg/...+""" vetos in user_role only veto out selected permissions granted by the "reg/" permissions, but they do not veto the permissions granted by a different scope, namely "adm/+". The net effect is therefore what we would want: that a user with both admin_role and user_role would have access to everything, irrespective of those two veto permissions of the user_role. 1 myRealm is the handle to the configured realm, eg $iniRealm or $isisLdapRealm etc. The bypass security component consists of an implementation of both the AuthenticationManager and AuthorizationManager APIs, and are intended for prototyping use only. The authentication manager allows access with any credentials (in a sense, "bypassing" authentication), while the authorization manager provides access to all class members (in a sense, "bypassing" authorization). Generally speaking your domain objects (or more generally your application) should be agnostic of the user/roles that are interacting with them; applying security permissions is the responsibility of the framework. Still, on very rare occasion you may have a need, in which case you can either use Apache Isis' DomainObjectContainer API or you can reach further down the stack and use the JEE Servlet API. Each role’s name property encodes both the realm that provided the role, and the role identity itself. then this corresponds to the roles "realm1:user_role", "realm1:self-install_role" and "realm1:analysis_role". If using the Wicket viewer, then note there will also be another role which is used internally (namely "org.apache.isis.viewer.wicket.roles.USER"). If you do need to access the servlet API and are running within the context of Wicket viewer, the Isis addons' servletapi module can provide access to the HttpServletRequest, HttpServletResponse and ServletContext. However, it isn’t possible to obtain any role permissions for the user. By and large the security mechanisms within Isis are transparent to the rest of the framework (the Wicket Viewer and Restful Objects viewer, and the overall runtime). That said, it is the responsibility of the viewers to ensure that there is a viewers to ensure that for each request there is a valid user session present. The sections below explain how this works. which means that they can only be accessed by a user with an authenticated session that has this special, reserved role. If not, Wicket will automatically redirect the user to the sign-in page. The sign-in page to render is pluggable; see extensions chapter for details. In the sign-in page the viewer calls to the Isis Authenticator API, and obtains back a user/role. It also adds in its special reserved role (per the annotation above) and then continues on to whichever page the user was attempting to access (usually the home page). And that’s really all there is to it. When the viewer renders a domain object it queries the Apache Isis metamodel, and suppresses from the view any object members (properties, actions etc) that are invisible. These may be invisible because the user has no (read ) permission, or they may be invisible because of domain object logic (eg a hideXxx() method). The viewer neither knows nor cares. Similarly, for those object members that are visible, the viewer also checks if they are enabled or disabled. Again, an object member will be disabled if the user does not have (write) permission, or it could be disabled because of domain object logic (eg a disableXxx() method). As well as providing a sign-in screen, the Wicket viewer also provides the ability for users to self-register. By and large this operates outside of Apache Isis' security mechanisms; indeed the various pages (sign-up, sign-up verification, password reset) are all rendered without there being any current user session. These pages all "reach inside" Apache Isis framework using a mechanism similar to Headless access in order to actually do their stuff. The sign-in verification page to render is pluggable; see extensions chapter for details. User registration is only available if the UserRegistrationService is configured; this is used by the framework to actually create new instances of the user as accessed by the corresponding (Shiro) realm. Because Shiro realms are pluggable, the Apache Isis framework does not provide default implementations of this service. However, if you are using the Isis addons' security module (non-ASF), then this module does provide an implementation (that, as you might expect, creates new "user" domain entities). If you are using an LDAP realm and want to enable user-self registration then you’ll need to write your own implementation of this service. Unlike the Wicket viewer, the Restful Objects viewer does not provide any sort of login page; rather it provides a pluggable authentication strategy, delegated to by the IsisSessionFilter filter defined in web.xml. The authentication strategy is responsible for ensuring that a session is available for the REST resource. Here AuthenticationSession is Apache Isis' internal API that represents a signed-on user. As you can see, none of these should be considered production-quality. 3 which paths are allowed to be accessed directly, without a session. The /restful/swagger path provides access to the SwaggerResource that dynamically generates swagger spec files from the Apache Isis metamodel. The above web.xml fragments do not constitute the full configuration for the Restful Objects viewer, just those parts that pertain to security. Isis currently does not have any out-of-the-box support for user-registration for applications using only the Restful viewer. However, in principal the pieces do exist to put together a solution. The general idea is similar to the design of the Wicket viewer; define some subsidiary resources that can operate without a user session in place, and which "reach into" the framework using headless access in order to setup the user. An alternative approach, possibly less work and overall of more value, would be to implement AuthenticationSessionStrategy for oAuth, in other words allow users to use their existing Google or Facebook account. So far this is just standard javax.rs stuff. Next, we need to ensure that a client can hit your new resource with the Apache Isis runtime in place, but without there being an Apache Isis session. For that…​. create a subclass of the AuthenticationSessionStrategy that automatically returns a dummy session if the resource being accessed is "/restful/signup", say. You could do this by subclassing AuthenticationSessionStrategyBasicAuth, but then using code from AuthenticationSessionStrategyBasicAuth to return an "exploration" (or better, "signup") session if accessing the "/restful/signup" resource. Obviously the methods exposed by the SignupResource are up to you; ultimately they need to be able to gather information to populate the UserDetails object as passed to the UserRegistrationService. Copyright © 2010~2015 The Apache Software Foundation, licensed under the Apache License, v2.0. Apache, the Apache feather logo, Apache Isis, and the Apache Isis project logo are all trademarks of The Apache Software Foundation.